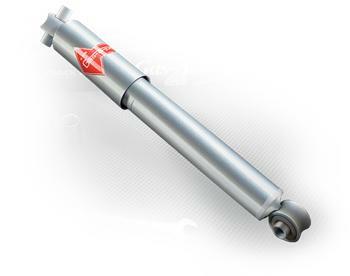 KYB Gas A Just shocks High Performance Shocks designed to deliver maximum driving control, KYBs Gas-a-Just High Performance Shocks provide a high performance ride. Gas-a-Just High Performance shocks higher gas pressure keeps tires glued to the road while its superior strength monotube design with floating piston makes for fade-free performance and the seamless cylinders and eye rings provide durability. The Gas-a-Just High Performance Shocks offer a wide range of applications including RVs and motor homes.